LAHORE: (Thursday, May 24, 2018): The book of Muhammad Anwar Barkaat titled “Hum sb ek hain” was launched at Punjab University College of Earth and Environmental Sciences (CEES). CEES Principal Prof Dr Sajid Rashid, Mrs Tanvir Kausar, faculty members and a large number of students were present on the occasion. Addressing the ceremony, Mr Anwar said that Allah has given us the lesson to be united and avoid divisions so we all must work together for the progress and prosperity of our beloved homeland. 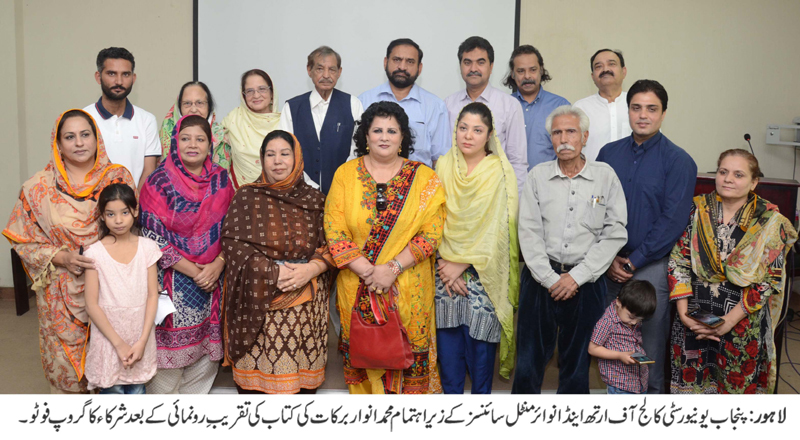 Dr Sajid Rashid said that all the sections of society must join hands irrespective of their differences and serve the interest of the country. He said that in this way we would be able to promote love and peace and make Pakistan an exemplary state in this regard.